By incorporating international styles into the Rocawear brand, the company has expanded its appeal beyond the national borders and has become a brand of international significance. As a result, Rocawear boasts offices in the UK, Japan, Canada, Europe, Korea, Middle East, and Russia. Womens Rocawear Ace Classy dress shoes from Rocawear featuring a t-strap design with an open toe, adjustable strap and 3 1/2" heel. Womens Rocawear Bailey Dressy sandals from Rocawear featuring a 4" stacked heel, RW logo medallion on the straps, and metallic RW logos allover. 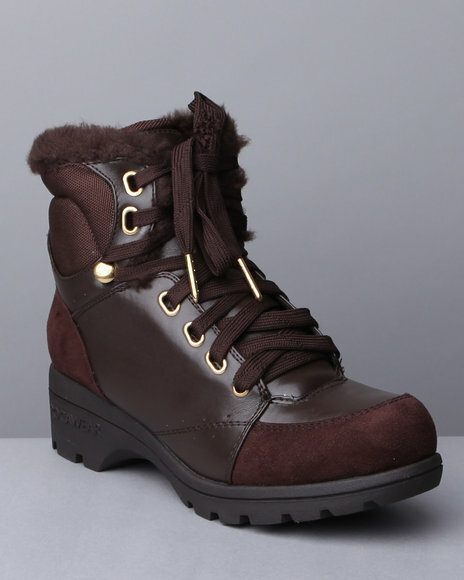 Womens Rocawear Elen Faux-fur boots from Rocawear, the Elen features RW fur logos, and contrasting trim with a rubber wedge sole. Womens Rocawear Elen $79.99 Faux-fur boots from Rocawear, the Elen features RW fur logos, and contrasting trim with a rubber wedge sole.